"There's nowhere else to go, this is your home now." I'm always fascinated with director Guillermo del Toro's artistic craft, and his latest efforts certainly do not disappoint. Check out his latest horror project - Crimson Peak. What I love about this trailer is how it only gives us a small peak into the twisted plot, never revealing too much. It is, however, pretty ballsy to claim this as del Toro's "ultimate masterpiece," but without seeing the movie, I will have to trust it for now. It does look effortlessly gorgeous and hauntingly seductive. It's pretty easy to showcase a scary movie, most of the time using cheap thrills/scares, but not in this trailer. Thankfully, del Toro just let's Mia Wasikowska, Tom Hiddleston, Jessica Chastain and Charlie Hunnam shine. Take a look for yourself and enjoy! 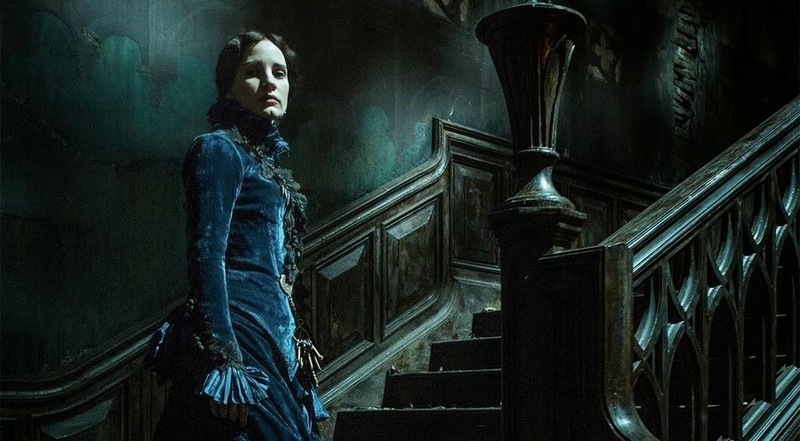 Crimson Peak is directed by Guillermo del Toro (Hellboy, Pacific Rim, and my personal favorite - Pan's Labyrinth) from a script he co-wrote with Matthew Robbins (Don't Be Afraid of the Dark, Mimic) and Lucinda Coxon (Wild Target). In the aftermath of a family tragedy, an aspiring author is torn between love for her childhood friend and the temptation of a mysterious outsider. Trying to escape the ghosts of her past, she is swept away to a house that breathes, bleeds…and remembers. Universal and Legendary will bring this movie to the silver screen on October 16th, 2015.